Antonio Vivaldi was one of the composers of the Baroque era that changed the form of the concerto from the Concerto Grosso to the Solo Concerto. The Concerto Grosso divided the instrumental group into two sections; the concertino, a small group of soloists and the ripieno, the rest of the orchestra. 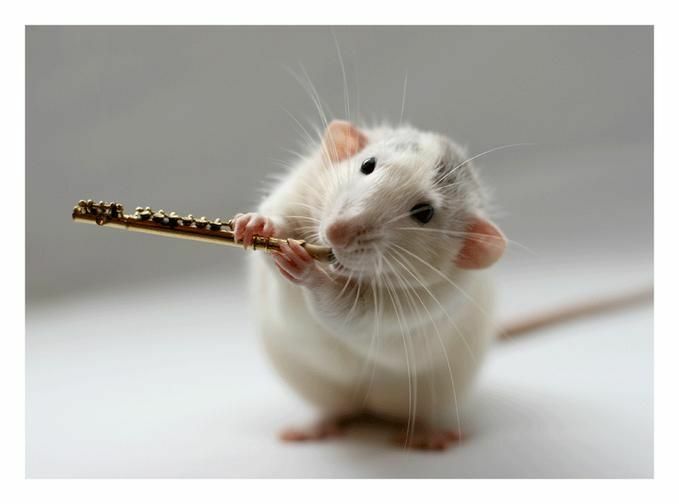 The concertino would take turns playing musical material as soloists and play together as a small group while the ripieno played between episodes of the concertino. 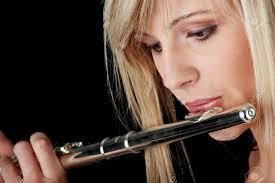 The flute concerto in D major (RV 427), is one of four works featuring the solo flute written by Antonio Vivaldi. Vivaldi wrote the piece in the 1730s, a period in which he wrote two of his other works featuring the flute, one in G minor and the other in C major. The concerto is in three movements. The first movement is in a fast tempo and is played by the strings as well as the solo flute. the opening movement contrasts a tuneful opening theme with a more lyrical motif in the minor mode. During the movement, the solo lute plays melodies in contrast to the ritornello. The movement consists of several sections, almost all of which incorporate a portion of the ritornello melody. 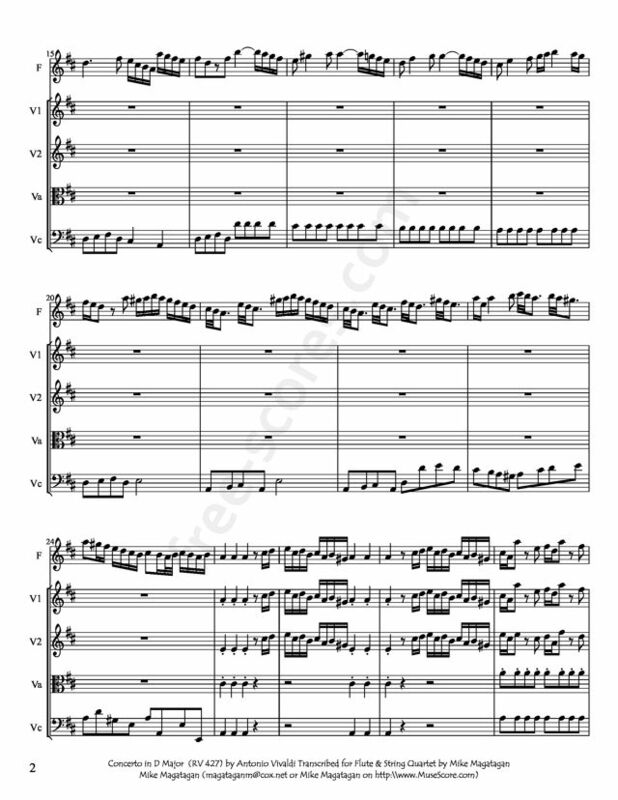 The second movement also consists of several sections described as a reflective meditation by the soloist against accompaniment by the strings. the movement has an exquisitely simple shift to triple meter. The third and final movement is another fast movement in a 3/8 time signature which has a bit of tarantella-like feel. Little is written about this, the Concerto in D Major. 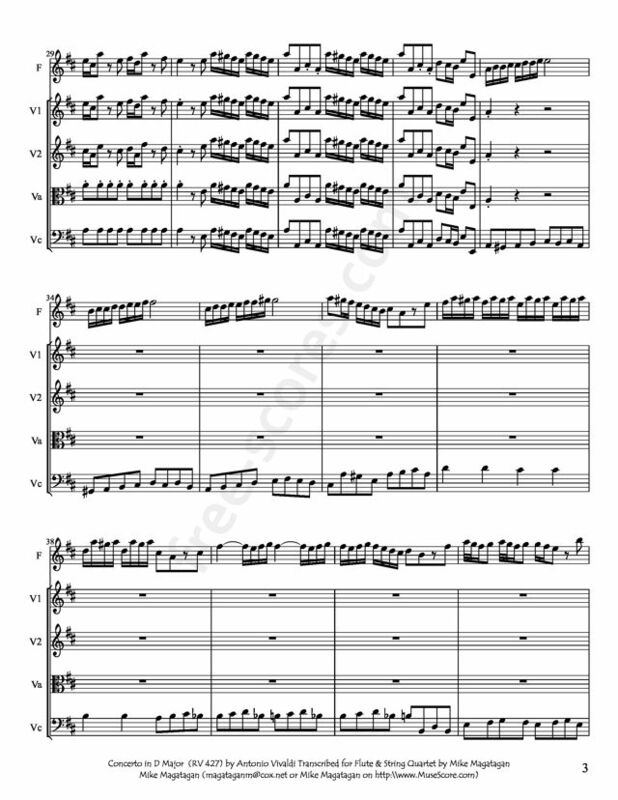 Although originally written for Flute, Strings and Harpsichord, I created this arrangement for Flute and String Quartet (2 Violins, Viola & Cello). 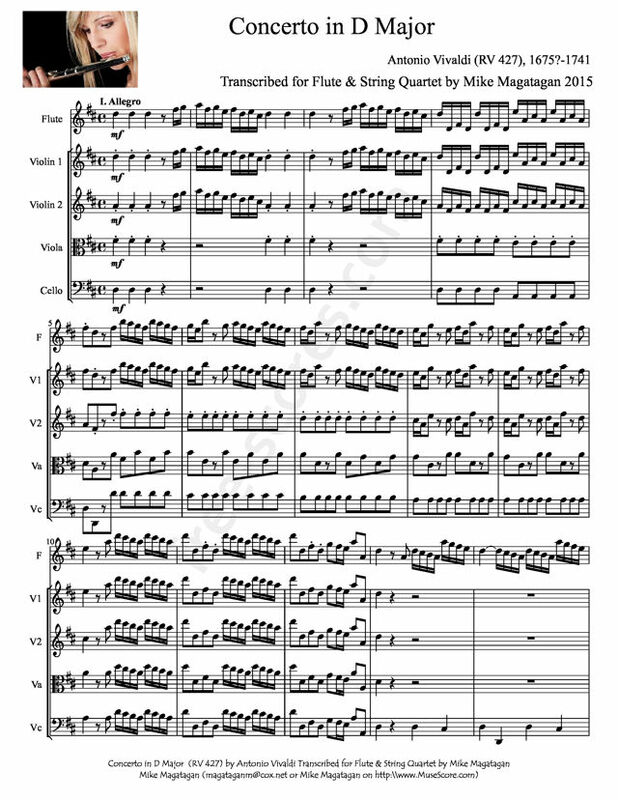 11 scores found for "Flute Concerto in D Major for Flute & Strings"